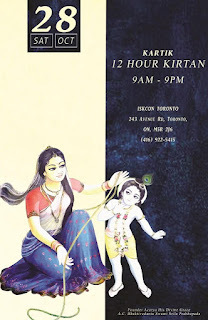 Kartik 12 Hour Kirtan - Saturday, October 28 ~ The Toronto Hare Krishna Temple! Kartik is an auspicious month to go deeper into our spiritual practice. This month is particularly dear to Krishna and those that perform spiritual activities, including chanting and hearing, will see the benefits compounded. A great way to receive special mercy of the Lord is to chant and dance together for as many hours as possible in a day. For that reason we are inviting every one of you to join for this 12 hour kirtan. Come, chant and dance with your family and friends with all your heart on Saturday, October 28, 2017 from 9:00am - 9:00pm!